Your book changed my life! I finally feel like I am in control of my life again financially. My finances were stagnating where they were. After reading your book I followed all your examples and implemented all of the principles you discussed (yes all of them). I first set up a “Latte” pay yourself first account. I will increase this shortly to reflect the 10% of my income strategy. It is amazing how one squanders one’s money on coffee and the like. 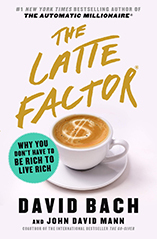 My “Latte Factor” was $180.00 a month. This included buying lottery tickets. What a waste when you can actually create your own “lottery” in a few short years by following your book. The next step was creating an “Emergency Fund” which I am increasing to one year reserve. It sure gives one peace of mind knowing that you have emergency cash on hand. The next two steps really saved me a lot of money. I increased my mortgage principle amount by 10% of my bi-weekly payments. By the way I already had a 25 year mortgage. I did the same thing to my car loan. My combined savings totaled $31,310.94 over the next three years. I am going to increase this a bit more in a month or two. Not a bad return for a fantastic book that cost $29.95. (1045.44% return) wow! I also established a charitable donation account for a $50.00 per month withdrawl. I will increase this in the future. Your book got me so excited that I was telling a few friends about what I learned – they kind of thought I was out to lunch. The best part of all this is that I set it up automatically and I now can relax without worrying about my financial future. This is the first time I felt that I am a lot closer to being a millionaire than I ever thought possible. Your book changed my life forever. I will not look on finances the same way again. I feel so much in control of my life now. I thank you for an interesting, informative easy to understand format. Well done Sir!